The most remarkable facet of the uproar about the condition of New York City’s public housing isn’t the outrage at the lack of heat in winter or its failure to test for lead. It’s that elected officials are discussing NYCHA at all. Until now, the vast public-housing system — 176,000 units — was out-of-sight, out-of-mind for most New Yorkers except for the 400,000-plus who lived there. Deplorable physical conditions — broken elevators, plumbing, entrance buzzers, kitchen stoves — were so common that the liberal Community Service Society in 2014 called NYCHA the city’s “worst landlord.” Yet it seems only Gov. 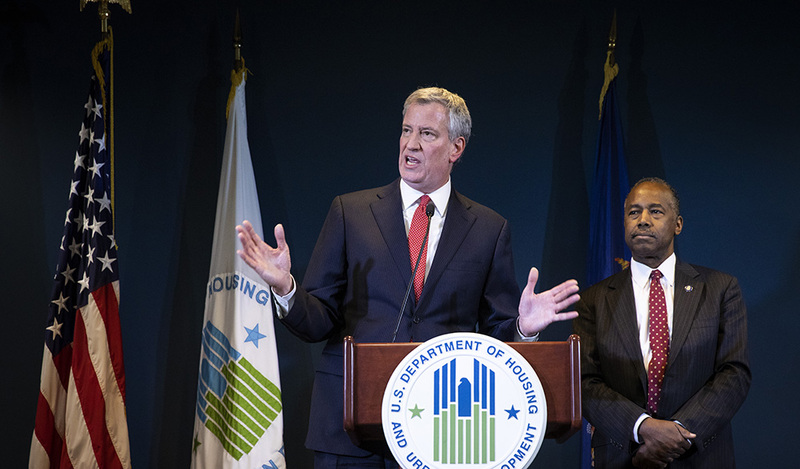 Andrew Cuomo’s zeal to embarrass Mayor Bill de Blasio has moved NYCHA out of the shadows. Yet there’s been more focus on who’s in charge — a new mayoral appointee or a state monitor — than what should actually be done to improve matters. There are, in fact, a series of practical steps that new leadership at NYCHA should quickly take — and longer-term moves which could prevent recurring crises. There are a lot of great options for whoever runs NYCHA next. The current crisis would be a terrible thing to waste. Of course, private ownership, under almost any conditions, is just what the system needs. Indeed, officials should push new, private construction on the ubiquitous open-air parking lots and often-dangerous open spaces of virtually all NYCHA housing. The Bloomberg administration left blueprints for shovel-ready apartment complexes on public-housing sites. This would not only create new housing but bring in revenue to rebuild the aging system and allow NYCHA to relocate some of the more than 25 percent of tenants who are “over-housed.” That often means a single elderly tenant in a three-bedroom unit for which there’s a long waiting list. Then there are the union contracts. It’s been an open secret at City Hall that outgoing NYCHA chair Shola Olatoye pleaded with de Blasio to push back on union work rulesthat increase maintenance and repair expenses. In fact, in a city replete with real-estate management expertise, there’s no reason for NYCHA to do anything other than contract out for all such help. Lower labor costs would quickly deflate the $20 billion to $24 billion figure cited for the system’s capital repair needs. NYCHA must also think long term. It’s a system of aging buildings which were originally meant to be maintained through the tenants’ own rent. That approach fell apart as the original working-class tenants moved out — and a new federal rule limited rent. To compensate, NYCHA needs new sources of income. One potential good one that no one should oppose: commercial development on NYCHA’s empty plazas and under-used green spaces. These would be perfect for the supermarkets and drug stores tenants currently have no access to; in fact, in my Manhattan Institute report, “Why NY’s Public Housing Should Encourage Commercial Development,” I found that many NYCHA projects fit the city’s definition of a “food desert.” The open spaces were conceived originally as an amenity; now they’re strewn with garbage and can be magnets for crime. And NYCHA’s property itself can be a source of revenue. Many developments — such as those in lower Manhattan and on the Brooklyn waterfront — stand on valuable property. Let’s find out if there’s interest on the part of private buyers, who could provide funds that would help repair the rest of the system. Those deep pockets could buy out current tenants — with those who’ve lived in their units the longest getting the most money. Of course, the fact that the average tenant has lived in public housing for almost 20 years is its own problem. “Moving to Work,” another federal program that NYCHA has overlooked, allows housing authorities to give preference to tenants who agree to receive only short-term (perhaps three to five years) assistance. That would be a good first step toward changing the culture in public housing — from that of a long-term poor house to a way to stay on the road to upward mobility. Howard Husock is Vice President for research and publications at the Manhattan Institute.